Although my keyboard has a metronome built in, I wanted one that I could use away from the keyboard, and which would give me a visual cue as well as an audible one. I chose this one as it was simple enough to use and had a pleasing, traditional appearance. This metronome’s wood effect does look remarkably convincing, though it yields its secret immediately on touch, which is smoothly plastic. The look, nevertheless, is still pleasing. But however attractive it looks, it has a function, and that is to keep time, so the purpose of this review is to report in an objective way on how it performs. <The metronome is wound by a fixed key on the side, and approximately ten turns of the key will fully wind it. 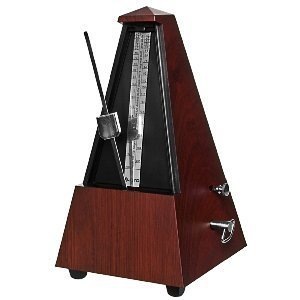 To set the metronome in motion, simply tap the pendulum rod to one side, left or right, and it will begin to tick, the tempo being chosen by first moving a click-stopped weight on the rod to align it with the desired tempo scale printed behind. For example, setting the upper edge of the weight against the ‘60’ line on the scale will give around 60 beats per minute, and so on. It is stopped in a similar way, with a touch of the finger, and will stay that way until you tap it into motion again. (i) how accurate is it? (ii) is the tempo consistent throughout a session? (iii) how long does it run on a winding? I measured all these using an electronic stopwatch and a statistical graphing calculator (well, it was raining outside, and there was nothing on the telly). The accuracy is very good throughout the tempo range, with the nominal 40 bpm setting giving 40 ticks in a minute by my stopwatch, the 60 setting likewise, right through to the 208 bpm setting. There’s no way to calibrate it, but the accuracy is certainly fit for purpose, and the weight can always be tweaked outside of the ‘click stops’. I could detect no asymmetry or ‘limping’, and so no difference in timing between the left and right strokes of the pendulum. I next looked at consistency, which I measured with the metronome set to 60 bpm, measuring the time per beat averaged over 10 beats at intervals of approximately 10 minutes. When fully wound and set in motion, the average beat time measured 1.028 seconds. After 10 minutes, it was 1.005 seconds ; after 20 minutes, it was 1.004 seconds ; and after 30 minutes (around stopping time at this tempo) it was 0.968 seconds. So consistency was good, with just a slight increase in tempo of around 5% towards the end of the half hour, though it took a stopwatch to tell me that, it wasn’t apparent to my ear. I have not carried out this test at other tempo settings, but am satisfied the results would be similar. How long it runs on a full winding depends on the tempo setting. I found that at a setting of 40 bpm, the lowest (‘Largo’), it will last a little over 45 minutes. Set to 60 bpm, run time is just over 30 minutes, at 90 bpm, run time is just over 20 minutes, at 120 bpm it lasts about 16 minutes, and at 208 bpm (‘Presto’), it will run for just over 9 minutes. To a rough approximation (it’s not linear), you get between 1800 and 2000 beats in total from one winding, whatever the tempo. There is a little bell which can be set to chime on every second, third, fourth, or sixth beat, or turned off, depending on how you set a small sliding lever. Whilst it’s useful to signal the first beat in every bar according to time signature, there is some reverberation in the bell, so that it becomes less useful as an aural cue the faster the tempo, and by around 160 bpm I found little advantage in using it as the sound of the bell began covering subsequent beats. It may be possible to muffle the reverberation somewhat by stuffing something inside the bell, but I have not thought this worthwhile for me. The tick-tock is quite loud, which is doubtless required when playing loud instruments, though I am primarily a recorder player, which is a softly spoken instrument. It would have been handy if the metronome’s sound level could be moderated, but even so it’s not a significant issue for me. It does what I wanted it to do, it does it accurately, it gives me the corner-of-the-eye cues I wanted, and it looks good. It is expensive for what it is (£28 post paid), but not so expensive I would change my mind for something cheaper.